Location: Sariyer district of Istanbul, Turkey. Notes: Rumelihisari (also known as Rumelian Castle and Roumeli Hissar Castle is a fortress located in the Sariyer district of Istanbul, Turkey, on a hill at the European side of the Bosphorus. It gives the name of the quarter around it. It was built by the Ottoman Sultan Mehmed II between 1451 and 1452, before his army's conquest of Constantinople. 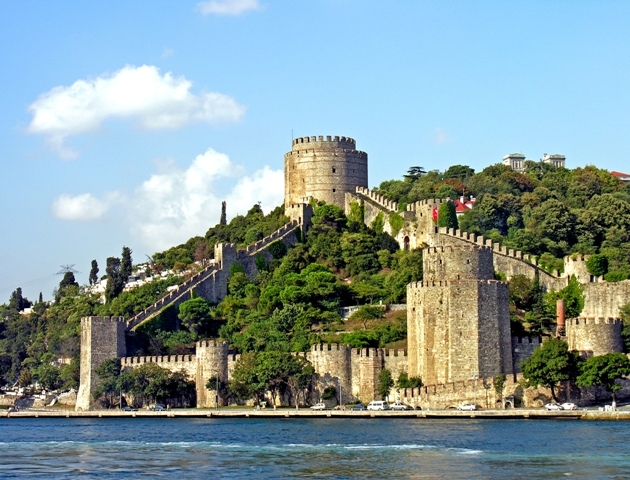 The three great towers were named after three of Mehmed II's viziers: Sadrazam �andarli Halil Pasha, who built the large tower next to the gate; Zaganos Pasha, who built the south tower; and Sarica Pasha, who built the north tower.